On May 29, the Finnish EMS provider inaugurated the expansion of its Polish manufacturing site in Sieradz. The expansion has provided the company with an additional 10’000 square metres of space. 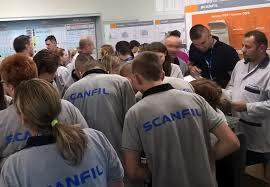 With the added 10’000 square metres of space, Scanfil’s entire operation in Sieradz now measures to almost 18’000 square metres. The unit is one of the company’s sites for volume manufacturing, and thus an important one. The investment improves the company’s capabilities to serve its customers close to their main markets – mainly Europe, a press release reads. “I think, the most important reasons to be and invest in here are: the location itself, its closeness to the European market, and people living in the area, who are highly motivated, enthusiastic, eager to learn and hard working. Also, the ease of doing business with local authorities, made it easy to further invest in Sieradz”, says Petteri Jokitalo, CEO of Scanfil Group, says in the press release.. Following the extension, the company is ready to create at least 200 new jobs and is aiming at double its sales.